The Abandoned Tree House from JaWaVi Films on Vimeo. iMovie has included a movie trailer section on the list of pre-loaded templates for quite some time now. Naturally being in the business of making movies and short films, you would think that I have created my fair share of these. Nope. 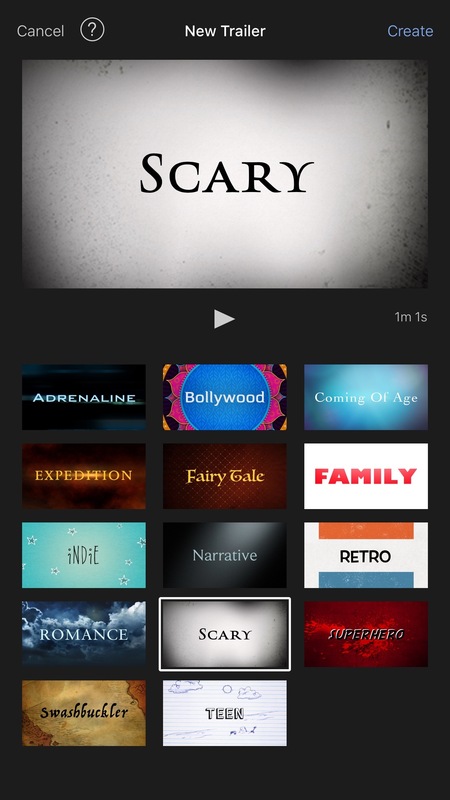 But iMovie allows everyone the opportunity to create a professional looking movie trailer. My boys had some friends over and wanted to make a “scary movie” since Halloween is right around the corner. That was going to be tough for them to accomplish as I watched my oldest son running around the backyard with his iPod Touch, recording shaky video via the front facing camera – that’s the only option afforded to these now dinosaur pieces of Apple technology. Seeing the effort he was putting in, I didn’t want him to be deterred by the difficulties of filming and editing what he had captured. So, I offered up my assistance in creating a scary movie for his little brother and their buddies that day. Initially, I thought I would record an actual short film for the boys, edit it with some haunting music and put it up online for them to show their school teachers. But, after we had finished the staging and acting with about 20 or so individual clips, I remembered the Scary Movie template for trailers in the iMovie software and decided to give it a go. If you haven’t already, download iMovie for your iPhone. It might be free for some as it is included in the Apple essentials package, but for others the $4.99 price tag is well worth the expense. iMovie is constantly being updated and even is equipped with force touch technology for the new iPhone 6s and 6s plus. Note: A powerful desktop version for Mac is available for download also. Open the app, select project, then tap the + button and choose Trailer. All of the options are great for whatever type of theme you’d like to go with. My two favorite are “Scary” for obvious reasons and “Retro”. Pick whichever theme you feel would work with the clips you plan on shooting or have already recorded. You can hit the play button to see a production example of the particular movie trailer you want to produce. Tap the create button and an outline will appear. This is where you can add the movie title and fill in your name or others to add to the credits which appear at the end of your production, which is a nice touch. Next to the outline tab is the storyboard. Pick storyboard and you’ll be presented with the type of shots you will need to complete your movie trailer. This is very useful as it serves as a de facto director and makes the process very simple. Either make a mental note of the type of clips to film or better yet, jot them down so you won’t have to keep going back and checking the app for guidance. Next, choose the individual shot selections, which will bring up your camera roll video history. Select the particular video clip you want and hit the upward arrow to insert it. It will already be formatted for the right amount of time. You can continuously change it until you’re happy with the way it looks and build it out from there. 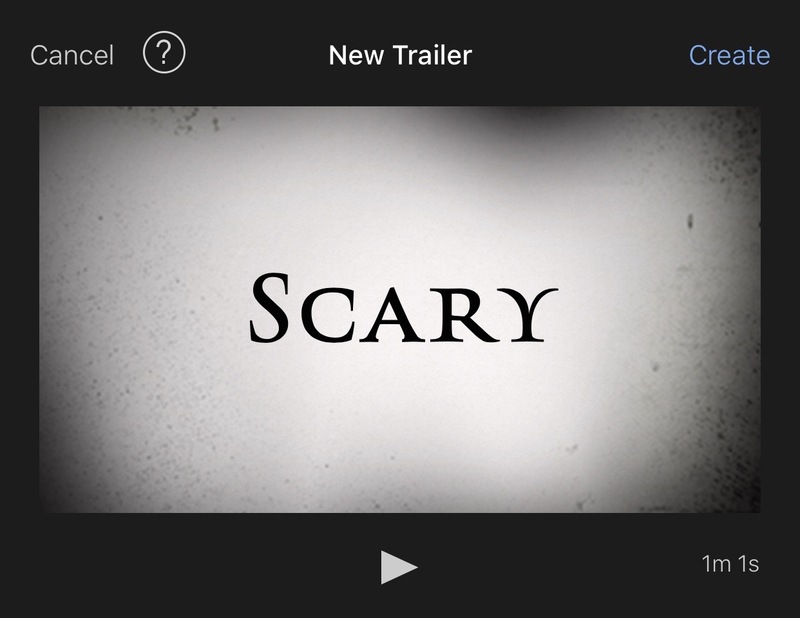 Once you’re done, play it back and when you’re happy with your new movie trailer tap the export button. Export is the square with the arrow facing up. Exporting your new movie trailer will allow you to send it to YouTube, Facebook, Vimeo or even save it to your camera roll for an easy share with your friends, followers or yourself. Make sure to film your clips in landscape mode. Vertical videos will not work. If you notice my own film, the actual clips of the kids in the movie trailer were filmed in the 2.59:1 cinemascope, which causes the top and bottom margins to be squeezed. I used my Filmic Pro app to record the kids because initially I felt as if I would just create a stand alone movie of them. It’s not a “deal breaker” but for congruency with the transitions, a 16:9 cropping would have been more ideal to match up better. Unless you use a third party app like Filmic Pro, this issue will not be anything to worry about because the iPhone in landscape mode will automatically film with a 16:9 setting. Arrange your shots with different depths of field, meaning settle in closely to your subjects for some and hold a more wide angle position on others. In other words, don’t zoom because it will degrade the quality of your film. I hope this quick explanation was helpful. Have fun creating your very own, Hollywood styled movie trailers.